Looking for the best self-cleaning litter box? Here you will find the top performers on a side by side comparison, with in-depth reviews describing the pros and cons of each unit. You will see the top winner and why this machine is recognized by people (and me personally), as the best on the market. 1. Dimension of the waste compartment. This is very important because the bigger the waste compartment is the longer without scooping the litter box. When the waste compartment is small you will need to empty it every 2 or 3 days or maybe every day with 2 or more cats. It’s not worth it. 2. How the system handles the urine. Liquids are not easy to contain and collect. When a cat urinates a lot, the automatic litter box needs to have a system capable of handle the urine and collect the litter clumps efficiently. 3. Level of Contact with cat waste. The best automatic litter box will require you to have a minimum contact with waste, so get a machine that doesn’t require extra manual scooping. 4. Litter the system uses. You may need to change the type of litter when getting a self-cleaning litter box in case the unit requires a different type of litter than what your cat currently uses. 5. Supplies. Some self-cleaning litter boxes need you to buy specific supplies from the Manufacturer for the unit to operate. Check this point if you don’t want to do that. 6. Level of noise. If a motor is too noisy it will not only bother your cat but it will bother you as well. Some cats are really skittish and may reject the litter box only due to its noise. Consider the noise level especially if you are going to place the unit close to your bedroom. 7. How easy is to disassemble it for washing. When it comes to clean the unit we expect all parts to be removable for washing. Some units have built-in pieces that can’t be cleaned easily. Consider this point if you really like to deep wash the litter box. Suitable for cats up to 20 lbs approx. Suitable for cats up to 12 lbs approx. Suitable for cats up to 12 lbs approx. Suitable up to 4 cats. Ideal 3. Up to 2 cats. Ideal one. Suitable up to 3 cats. Ideal 2. 24 lbs 22.5 lbs 26 lbs 9.3 lbs 13 lbs. 12.5 lbs 13.5 lbs 12 lbs. 3-7 or 15 min after the cat leaves the litter box a special rotating mechanism drops the waste into a drawer. Disposable trays with crystals that absorb urine and feces get collected by a rake into the tray’s waste trap. Urine disposed through a waste/water drain. Clumps scooped by a rake then liquefied and disposed through a waste-water drain. A scooping rake picks up waste clumps and put them in a waste receptacle. A rake pushes and lifts the waste, dropping it into a waste compartment. Urine and feces get pushed by a rake into a waste compartment. Conveyor’s motor rotates a litter bowl sifting the waste through the conveyor to fall into a waste compartment. A scooping rake automatically collects the waste and deposits it in a waste compartment. Rotation stops if a cat re-enters the litter box and resets for another 3-7-15 minutes. It resets to 5,10 or 20 more minutes delay if a cat re-enters It resets to 10 more minutes delay if a cat re-enters (30 min in Cat Activation mode). If sensors detect the cat a red light turns on and restarts the cycle for another 15 minutes. It resets for extra 10 minutes if a cat re-enters It stops and resets for another 10 minutes if a cat re-enters System rotates very slowly, safe for cats It a cat re-enters the unit, it stops and resets for extra 15 minutes. Toss the bag every 5-10 days (depending on the cat). Average: 7 days Change tray every 10-20 days (see note 1) Empty waste evert 3-4 days. Self waste-disposing Depending on the cat’s habits, every 2 to 5 days. Change or empty plastic compartments every 4-7 days Change or empty compartment every 4-7 days Every other day approx. Every 2 to 5 days, depending on the cat’s defecation habits. Wash the Globe ideally every month Wipe surfaces once a month Clean the impeller once or twice a month. Clean the unit every 2-3 months Clean the rake when needed. Wash the tray 3 times a month or when needed. Clean rake and sensors when needed. Wipe the unit when needed. Sensors and rake when needed. Wipe unit 3 times a month or when needed. Wash the bowl 3 times a month or when needed. Clean the rake when needed. Remove and wash the tray 3 times a month or when needed. Globe and waste drawer can be washed using mild soap Remove waste trap and wipe surfaces and rake with mild soap and water. Disassemble the unit, wash the base and brim with mild liquid soap and water, reassemble it. Fully disassemblable. Wash with mild soap and warm water. Wipe sensors with dry cloth and pan with a damp cloth. Wash pan & rake. Wipe sensors with dry cloth and unit with a damp cloth. Wash tray & rake. Disassemble the unit and wash the non-electrical components. Wash litter pan, rake and bin with warm, soapy water . (*) Ratings are the average of the totality of customers reviews and other factors and they are subject to change (**) Costs are approximate and they could change. (1) Cost depends on the clumping litter you use and how often you change carbon filter (2) Depending on the cat you may need to change tray every week (3) % of satisfaction is different than rating and it represents customers that have rated the unit with 5 and 4 stars over purchases online, this number might change in the future (***) You might not have these issues, it depends on the cat and the correct usage, but also some issues come from the unit design (****) Check details of warranty policy with the manufacturer or distributor. WHY IS THIS UNIT THE LEADER ON THE MARKET? 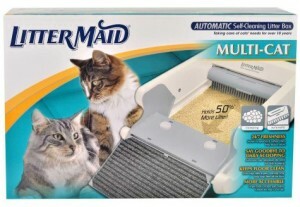 STRONG ADVANTAGES: High percent of reliability, fully self-scooping, not dirty rakes, saves up to 50% on cat litter, indicator when to empty the litter box, unique mechanism to release all the waste from the bottom, minimum noise, high capacity to collect the cat waste, practically zero odor. 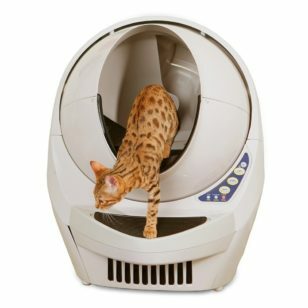 I can tell you the reasons why the Litter Robot is so dependable because I own a Litter Robot 3 and I’ve investigated automatic litter boxes for over 5 years now so I consider myself very knowledgeable about how most of them work (actually you will find other review-websites with my reviews). I know every single downfall that most of them have and this unit doesn’t have any of those issues. Only if your cat is an enthusiast litter kicker some litter could spill out the litter box, but this rarely happens. Solution: to stop litter spillage, get the fence or the ramp, they both come as optional accessories. You can also get an easy to clean litter mat. If you pour too much litter in the globe, the unit might not complete a rotation. Solution: to allow a smooth rotation you must pour litter only up to the full line indicator (approx. 12-13 cups of 8 Oz). If you let the Globe go too low on litter, the unit won’t activate to start a cleaning cycle. Solution: Simply top the unit off with litter every week. Occasionally some litter may fall between the bag and the waste drawer (this hardly happens). Solution: to avoid leaving a gap between the waste drawer and the bag you have to line the bag tightly to the drawer, that simple. IDEAL CAT OWNER: People that want to forget about the cat’s litter box for several days, up to 10 days with one small cat (personally, I only think about the litter box on Sundays when I take the trash can outside). People with medical conditions that can’t bend over too much to take care of the litter box on a daily basis. A cat owner willing to do a big initial investment but without future expenses on the manufacturer’s supplies. SPECIAL GIFT FOR CAT LOVERS! If you love the Litter Robot Open Air as I do, you can get $25 Off the price. Just check more details on my Litter Robot III review where you’ll see the Pros and Cons of this machine, demonstrative videos with my cat using the unit, tips for better use, and much more. Note: The Litter Robot Bubble is not available on the market anymore. The Litter Robot III Open Air supersedes the Bubble unit, due to the excellent engineering applied to it, making it the top one. GREAT NEWS! NOW YOU CAN PROGRAM AND MONITOR THE LITTER ROBOT OPEN AIR FROM YOUR IPHONE! (Android soon). Learn all the new features of the Connect App and see my exclusive hands-on review and get $25 Off your purchase! The second best rated automatic litter box. We could state that the ScoopFree handles the urine until the tray needs to be changed (every 10 to 20 days, depending on the cat) and the feces clumps until the waste trap gets full and then you need to scoop it (every 3-4 days). ADVANTAGE: Convenient disposable tray system that you don’t need to clean after use. You just need to dispose the used tray and replace for a new one. The bottom of the unit is a cardboard tray and it may be susceptible to leaking. Solution: For the same reason sidewalls are not fully sealed. This could be a problem with certain male cats. Solution: only alternative option, if your cat scratches the bottom or urinates on walls, there is a plastic permanent tray that can be used with crystals. Smelly crystals. Solution: you need to stir the crystals every day and place the unit close to circulating air to make the crystals work better. Waste compartment too full before time to change tray. Solution: waste compartment needs to be scooped before switching to a new tray. IDEAL CAT OWNER: People with the budget to buy disposable trays to keep the unit odor free (depending on the cat, trays have to be changed every 10-20 days with one cat). IDEAL CAT: Small to regular size cats that can handle crystals as litter. Cats that don’t urinate on walls or scratch too much when digging. Cats that don’t eat by-products or have urinary or digestive problems. 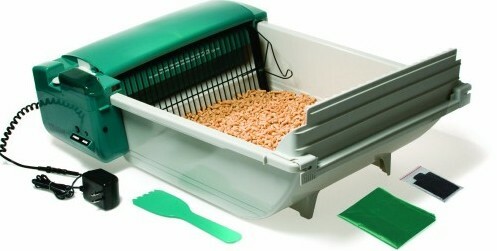 If you feed your cat corn or wheat based dry food the Scoopfree isn’t going to work the same. Healthy dry cat foods are essential to reduce the amount of waste your cat creates. 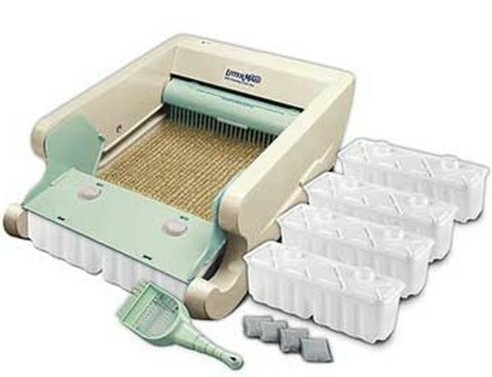 The CatGenie is the only automatic litter box that self disposes the waste. The unit needs a work intervention in the house to install it. It fully takes care of scooping and flushing the waste. ADVANTAGE: Fully self-cleaning and self-disposing automatic litter box. No need to carry bagged waste to dispose. The CatGenie is like a mini cat toilet. Excessive granule-litter tracking granules. Solution: granules tracking can be minimized getting the Sidewalls. Waste drain line and/or impeller gets clogged with cat hair or granules (not always). Solution: Brush your cat often to avoid hair from going into the impeller and disassemble the unit to clean the impeller periodically. Bad smell during a cleaning cycle. Solution: Set the unit away from living areas. IDEAL CAT OWNER: People who do not want to dispose of waste. People willing to unclog the unit if needed and clean the granule-litter tracking. People that have a 2d bathroom (ideally the garage’s or a laundry room away from living areas) to install it. IDEAL CAT: Small to average size cat with firm stools and that does not shed too much. 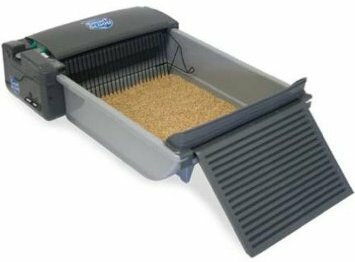 This unit is very similar in structure to the SmartScoop litter box, but with a slightly stronger motor and higher sidewalls. ADVANTAGES: Rake-scooping system does not push clean litter to waste compartment and does not create piles. Good price. Cleaning does not start. Solution: clean sensors with a soft dry cloth. Waste stuck behind rake. Solution: power off the unit, lift rake and clean. Unit struggles through cleaning cycle. Solution: redistribute the litter on the pan, make sure litter level is not too high. Scooping-rake does not scoop urine clumps attached to the litter pan. Solution: scrape litter pan to scoop urine clumps. IDEAL CAT OWNER: People willing to scoop and scrape the litter pan when needed, pouring litter in the litter box every 3-5 days and leveling the litter daily. People with one or two average size cats and without a budget to buy special extra supplies to make the unit work. IDEAL CAT: Small to average size cats (under 15 lbs.) that are not diggers, cats that use mostly the center of the litter area. Cats without urinary problems. This model has some adjustments, such as the plastic rake, more powerful motor and the night timer has been removed. ADVANTAGE: Good complement in scooping the litter box for a reasonable price. It can be used for two small or medium sized cats. Rake being stuck. Solution: turn off the unit & clear the areas from the litter. Feces caught on the rake and tray. Solution: spray silicone or special oleum on rake and tray. Litter accumulated on the ends of litter pan or behind the rake. Solution: re-distribute the litter and scoop if needed. Litter spillage when the rake is depositing waste into the receptacle. Solution: use very good clumping litter. Clear litter in edges of the machine. IDEAL CAT OWNER: People that need a complement to scooping, which means willing to scrap the bottom pan to scoop stuck clumps, maintain the unit properly and keep an eye on the machine at least once a day. IDEAL CAT: Small to medium size cats if used by two cats. One cat up to 15 lbs. Ideally cats without digestive or urinary problems and not for extreme diggers. Cats that don’t use corners. This model is the return of the original Classic Littermaid that was discontinued though not as durable as the original. The unit seems to be better than Littermaid Elite versions, mainly because of its plastic rake. ADVANTAGE: It complements the daily scoop for a good price. Dusty sensors. Solution: don’t overfill the litter pan. Rake gets stuck and it does not move so the unit doesn’t complete a cleaning cycle. Solution: use Premium clumping litter. Waste stuck on tray/rake. Solution: spray silicone on tray/rake or clear and re-distribute litter in areas where the rake moves. IDEAL CAT OWNER: Somebody willing to check on the litter box at least once a day and willing to clean and scoop the unit when needed. People that need a complement to a scooping and not leaving the unit alone for more than a day. IDEAL CAT: Small to regular size cats (under 15 lbs.) that don’t create too much waste. Cats with no urinary problems. Cats that use the center of litter area. The unit rotates constantly at a very slow rate, creating a permanent cleaning cycle. ADVANTAGE: Good sifting conveyor system to collect the waste. Litter accumulating under the conveyor. Solution: scoop the excess of litter and redistribute litter around the conveyor and clean the conveyor itself. Unit making grinding noise when rotating. Solution: check between base and plate to be clean. Conveyor needs to be clean and cleared often from the litter. IDEAL CAT OWNER: People willing to do a daily maintenance on the unit. People with one small size cat that want an extra help from scooping every day. IDEAL CAT: Small size cats weighing 12 lbs. or less. Cast without physical disabilities. The first brand introducing the innovative concept of rake-scooping and not rake-pushing. ADVANTAGE: It collects waste clumps by scooping the surface of the litter box. It does not collect urine clumps attached to the litter pan. Solution: scrape the litter pan manually. Clumps fall by gravity into the waste compartment and may fall onto the floor in the process. Solution: place a mat underneath. IDEAL CAT OWNER: People with time to scrape the urine clumps from the bottom of the pan and pouring litter every 3-5 days approx. IDEAL CAT: Small to average cats (under 15 lbs.) that usually use the center of the litter pan. Cats without urinary problems. Cats love a clean litter box and this fact influences their behavior enormously. When a cat finds the litter box always clean to do its business he or she is a happier cat. After all, having a happy cat is what every cat owner pursues, right? Your cat will feel confident and comfortable in its territory, plus a litter box that is always clean reinforces good habits in your pet. When you clean the litter box manually, have you noticed that your cat uses it right away after? This means your pet has been waiting for a clean “toilet”. Actually, keeping the litter box dirty is one of the main reasons why cats stop using the litter box. Now, imagine if the cat finds the litter box clean AT ALL TIMES, that’s the best gift you can give your cat! Cats are very clean animals and they really appreciate a clean “bathroom” as you would do for yourself. A dirty litter box with waste sitting for a long time creates a lot of germs that get mixed in the litter. When cats use a dirty litter box these germs contaminate the cat’s paws and this means every time the cat cleans itself those germs will go to the cat’s intestine. There are several pathogen agents in cat waste that is sitting all day, especially in warm weather. When cats go to do their business in a dirty litter box is like somebody trying to walk in a mining camp; cats try hard to avoid stepping on the clumps sitting there because they love having their paws clean. They are smart. 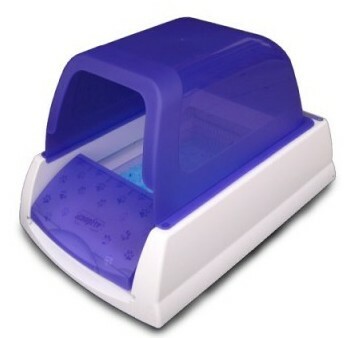 The best automatic litter box will always ensure your cat won’t contaminate his paws with waste. Some cats are pickier than others when it comes to using the litter box. If you have a cat that sometimes does its business on the carpet, rug, or anywhere else, it may be telling you that he or she hates the dirty or smelly litter box. Sometimes it’s not a matter of the cat being too picky. 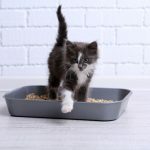 As mentioned previously, felines try to avoid standing over clumps while doing their business and this is why cats usually choose the corners in the litter box with the consequences of the typical litter box “accidents”, poop or urine outside of it. Either way, having a cat that is too picky or a cat that is simply trying to keep their paws clean the result is the same: the cat’s poop or urine will end up in places you don’t want. If the litter box is dirty the cat will wait and will hold in the urine, sometimes for hours. This situation is not noticed by you, you just see your cat walking around normally as every day and your litter box is “fine” in your eyes, with some clumps sitting in it. 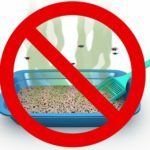 But if your cat uses the litter box right after you clean it, most likely your pet has been holding in the urine and when a cat does that every day for several years, your pet could develop urinary issues. Urine sitting in the cat’s bladder too long means toxins that don’t pass, which could create sludging in the bladder. The same if your pet holds in “poop”, that is very unhealthy for its intestine. You don’t want that for your cat. A top self-cleaning litter box will keep your cat from holding in urine or poop. If you have more than 2 cats, keeping up with their litter boxes could become a hard task. This means the litter box will be dirty most of the time when 2 cats or more use it. Cats don’t like the waste of another cat in the litter box, they prefer their own scent and if you don’t have enough room to place two or more regular litter boxes this could be a problem. Two or more cats using the same litter box could lead to territorial issues too. Even if the cats share the litter box with no sign of rejection they are not happy and sometimes one of them will do its business somewhere else as a sign of protest. The best automatic litter boxes are capable of keeping the litter bed clean always, which means there is no problem for cats to share one and you save room in your house by using only one unit as well. Find The Best Spot To Put The Cat Litter Box! I have two outdated one of them discontinued littermaid automatic catboxes. I love them except for the droping of litter outside of the catch box at the end of scopping.Still trying to figure that out. I will try the silicone spray suggestion very soon. Thanks for the idea. I’ve owned a cat genie for years now and I am surprised that it’s still the only fully automatic on the market. The main issues covered above are true, litter tracking and the rare pootastrophe are the major issues. If I averaged it out it would equate to one major maintenance issue each year which entails a complete breakdown of the unit followed up with a thorough cleaning. The litter tracking is the only issue the company hasn’t worked out, and no don’t try your own substitute litter just no don’t do it … Not once should you entertain that idea … No. Thanks Shawn for your input, your experience with the unit will help people to decide with more information. Thanks again! I am considering the cat genie, but am worried about having to clean it when it gets clogged. How difficult it is to clean the impeller to prevent the unit from clogging? Is there a video showing this? We have three cats, of which one ragdoll (long hair!) and one with somewhat loose poo. Is this one out of the question for us then? And how disgusting it is to clean the unit if/when it gets clogged? I have read some really bad reviews on Amazon and have been put off a little…Many thanks for any input !! Hello Eva, cleaning the CatGenie is not that hard but certainly is not a breeze either. You can see a video how to clean the unit here. Personally, I would use the Litter Robot for your cats, but that’s just my opinion. Thanks for visiting my website! We have a cat genie. If your cats poo is even a little bit soft it is a disaster. It doesn’t get scooped out but rather smashed in to the scooper and remains for the rest of the cycle. The cycle ends with blowing it dry….. so basically that means the stench of the poop still stuck on the arm gets blown all over your house. Gross! Also… a large portion of the granules get flushed down the toilet. I haven’t researched those exactly… but I can’t imagine that it is good for your plumbing. The granules seem to be plastic. Maybe they biodegrade? Idk.. not my fav. We are looking in to other systems. 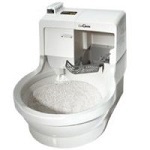 Hi Sheri, the granules of the CatGenie are biodegradable and yes, the unit works better with firm feces. You might want to check the Litter Robot if you need an alternative option. Thanks for sharing! I was looking up info on what my best oppositions are litter boxes. Thanks for your review, I currently own a Catgenie and hate it the smell when it cleans itself is absolutely horrible. The smell seeps out through the entire house even though it’s in my laundry room.And yes we keep it clean. I don’t recommend buying this also because of the cleaning supplies for it ridiculously priced and it’s not suitable for multi cat home. Since the cleaning cycle takes 40minutes. I will be looking into your advice on the robot. Quick question – I see you have the Litter Robot III (I read your link re: technical reasons) – can you tell me if the pros truly outweigh the cons between it and the II Bubble? I only have one cat (4 months old) and don’t plan on having multiples. We currently have the Petsafe Simply Clean (all that was available at Petsmart when we adopted him from the shelter) and he has already figured out how to knock off the belt cover and remove the plastic bag (kitties love plastic bags for play time!!) from the bucket without removing the bucket, so I’m needing something a little more tamper proof. Looking at the Litter Robot’s website comparison, I don’t really need the additional features on the III, so I’m wondering what the benefits truly are? Can you offer anymore insight? Or should I just go ahead and plunk down the extra $50 on the III? Thank you for your advice! This review was amazing!!!!! Hell Ness, both Litter Robot Bubble and Open Air are good devices. IMO the most important difference to choose the Open Air over the Bubble is the odor control. The drawer keeps the smell much better contained than the Bubble. Another big difference is that with the Open Air the possibility of blockage of the globe is close to zero, not the same with Bubble if you forget to empty the waste drawer after several days the globe doesn’t rotate and sometimes the outside of the globe gets dirty. Also, the Open Air features a shield inside the Globe that contains the clumps when they fall into the waste drawer. This avoids the upper inside of the globe to get in contact with the clumps. Additionally, the entry of the Open Air is much wider and bigger than the Bubble, this makes cats feel much better when going inside. Finally and a very important difference is the fact that the Open Air doesn’t need the cat to step on the step to activate the weight sensor. With the Classic and Bubble if your cat jumps into the unit the weight sensor won’t activate and the globe won’t rotate. That’s why the Bubble needs the ramp to the step as accessory. Honestly, both units will work for your cat, but I highly recommend you to get the Open Air because it addressed the issues that the Bubble and Classic have. I couldn’t suggest you otherwise since the Open Air has changed my life as a cat owner. Hope that helps! Hello! 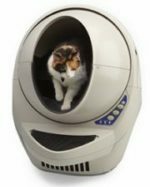 I have a couple of questions regarding the Litter Robot III. I have 2 cats, one is super picky about the amount of litter the other is a digger. I also have urinary problems with the boy (who likes a lot of litter). If the litter box isn’t clean, he will use the house. Mostly carpet. I’m so ashamed I can’t get it under control. I have a very busy schedule of full time class and work, and I’m not always able to clean it every day. No one else in the house will. I know with the cleanliness, it won’t be an issue, but I read the review. Since you can only use so much, could they both be satisfied? It looked full in the review, but will it be deep enough for my girl to not get her paw stuck? I want to know before I totally invest in a Litter Robot. i have 5 inside cats and I am a fanatic when it comes to keeping the boxes clean. My dilema, i have to be away for 5 days and was looking at getting an automatic litterbox. My oldest daughter will be coming in twice a day to check on my cats and litter boxes and feeding and etc. Any suggestions on which box to purchase? I was thinking of purchasing the scoop free ultra self cleaning box. Any reviews on that one? Hi Donna, I personally use the Litter Robot Open Air because is 100% reliable. With the Litter Robot your daughter won’t need to scoop the litter box but only to remove the bagged waste by opening the waste drawer at the bottom of the unit. My suggestion is getting the Litter Robot Open Air and placing a regular litter box as complement for your 5 cats. I don’t recommend the ScoopFree for 5 cats, the litter area is not that large to handle the waste of 5 cat. You can check a review of the ScoopFree here. Hello love this elf cleaning litter box with reviews kinda guide. 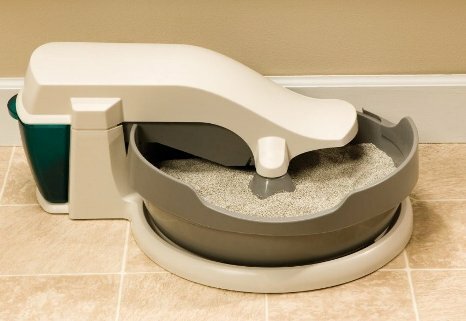 I wonder is this your picks for best self cleaning litter box? 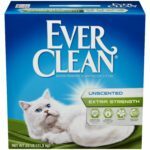 I’m looking to buy one of these self cleaning litter boxes since they seems very good and best. Hello Sofia, I use the Litter Robot Open Air and it’s the best not only my opinion but the one of hundreds of customers. You can check a full review here and decide. Good luck! Hello Perry, the Cat-illac doesn’t belong the self scooping systems. However, I will make a review soon and post it on the litter boxes category. Thanks for your comment! Hi Michael, according to my experience, the Litter Robot is the most reliable system. With my single cat can go up to 11 days without emptying so with 2 cats it should be from 5 to 6 days without emptying it. 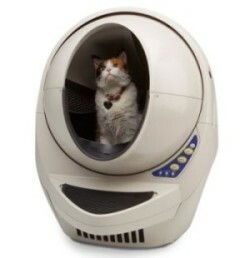 If you want to get extra control of the unit, you can get the Litter Robot Connect that works with iPhone. With the Connect you can check on your phone how many times the cats use the litter box and when to empty it. Hope that helps! I have the scoopfree litter box or the number 2 on the comparison list. I had one cat when I bought it and then I got another kitten. Everything was fine. They both used it with no messes outside the box but then I moved to a bigger room in the house and now the kitten is pooping outside of the box. I don’t know what to do or why the change in behavior all of the sudden. Hi Evangeline! Your cat may not like something in the new room. Moving the litter box to a new room may be a trigger for your cat to show this behavior. Usually cats manifest their adaptability to new areas by using or not the litter box. We do not like to use clay litter. The Robot one sounds great except for the note about using clay. Why can’t other form of quality clumping litter be used. We prefer the corn or wheat based. what would you recommend for a cat hotel (hosts cats while owner’s on vacation). Automatic litter is less time consuming and so reduces costs in the long run. each room is for max. 2 cats (3 if same family) and is small but 3D structured for cats to climb. 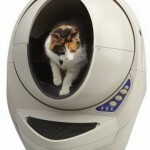 Hello Besnier, I absolutely recommend the litter Robot Open Air. You don’t really need to do much to keep it clean, only top it off with litter every week and empty the waste drawer every week as well. It’s the most reliable and convenient auto litter box so far. Hello Besnier! What is the distance between the litter box and the cats? In reality the Litter Robot makes noise but is not that noisy either. My cat got used to that noise and she seems to understand the litter box is cleaning cleaned :-) and she actually can stand right next to it when it’s running. Most cats get used to the Litter Robot operation. If your cats have some distance, let’s say 15 feet from the unit they will have enough room to get used to the Litter Robot but after some time they will able to stand right next to it when operating. Some cats are even fascinated when looking at this machine rotating. Hope that helps!